Post: Gaurav Akrani. Date: 7/05/2010. No Comments. Label: Management. Leading is one important function of management only next to planning and organizing. It is the liveliest element in the management process. It initiates actions to translate the decisions into concrete actions. Managers have to lead their subordinates through guiding and motivating. Leading involves directing, influencing and motivating employees to perform essential tasks. Every manager has to act as a leader in his area of operation. This means he has to guide, instruct, lead and motivate his subordinates so as to use their skills, efficiency, capacity etc. for the benefit of his Organisation. He has to influence the behavior of his subordinates and get the work done through their collective efforts. Leadership qualities are required in order to conduct various managerial functions effectively. Each and every group of people engaged in a particular activity needs a leader in order to guide, co-ordinate and control their efforts. In this sense, leadership is required for the conduct of economic, social, political or cultural activities. A college principal, secretary of a co-operative society or of a sports club or cultural association act as leaders in their respective fields. 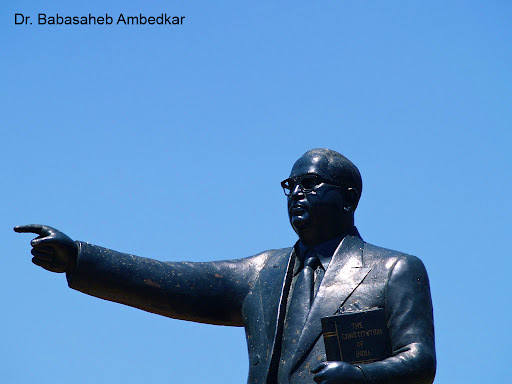 George Washington, Abraham Lincoln, Winston Churchill, Dr. Babasaheb Ambedkar, Mahatma Gandhi, Nelson Mandella, John F. Kennedy are world known political leaders while Henry Ford, J. R. D. Tata and S. L. Kirloskar are known leaders in the business world. Here, we are concerned only with the managerial leadership. Managerial leadership is that part of a manager's activities by which he influences the behavior of his subordinates towards a desired objectives or results. Leadership is followership. A good leader leads but does not push. Effective leadership can guide a group towards certain ideals without exerting much force. Managers who possess the quality of guiding and directing the subordinates under inspired impulses can be called business leaders. Leadership is concerned with getting results through people and implies the Organisation of staff into productive teams, groups and departments. Leadership entrails the creation of human structures, their motivation and direction; the resolution of conflicts at the workplace, creating vision for the entire business and providing resources in support of this. Manager can perform various managerial functions more effectively by providing proper leadership to his subordinates. This makes leadership an inevitable aspect of management process itself. Leadership is essential for the success and stability of a business enterprise. Managers possessing leadership qualities are called business leaders. According to Koontz and O'Donnell, "Leadership is the ability of a manager to induce subordinates (followers) to work with confidence and zeal." According to George Terry, "Leadership is the activity of influencing people to strive for mutual objectives." According to Peter Drucker, "Leadership is the shifting of own's vision to higher sights, the raising of man's performance to higher standards, the building of man's personality beyond its normal limitations." Involves guiding and motivating : Leadership is a managerial process of guiding and motivating the subordinates for achieving organizational goals/objectives. For motivating, communicating is necessary. Leadership is described as an art of influencing and inspiring subordinates to perform their duties efficiently. Needs subordinates and common interests : It pre-supposes the existence of subordinates. There must be common interest for the leader and his followers due to which they cooperate and participate for achieving common objectives. Promotes interest in the work : The purpose of leadership is to influence, motivate and encourage subordinates to take active interest in the work assigned and give the best results. Needs support from all : The leader must recognize the presence of all employees irrespective of their position. The leader cannot become successful unless he obtains support from all. Influences subordinates through personal qualities : A leader understands the problems of his subordinates and influences them by his personal qualities. Dynamic and continuous process : Leadership is a dynamic and continuous process. It is a regular activity of guiding and motivating subordinates for improving their performance and contribution towards organizational objectives. Leadership is situational : An ideal leadership is always situational. A leader has to study the prevailing situation and provide appropriate leadership to his subordinates. Assumes obligation : A leader always inspires followers. In the event of failure, he does not shift the responsibility to his subordinates but accepts his personal weaknesses in performance. A leader leads by setting good example. Needs interaction with followers : The objective of the leader and his subordinates should be the same. If the leader attempts for one purpose and his subordinates for some other purpose, it is no leadership. Their interest must be identical. Achievement of objectives : The success of a leader largely depends on his ability to achieve organizational objectives. When a leader fails to attain the objectives, he is of no utility to the management. 4. Qualities of a Good Leader / Leadership Qualities. There are different styles of leadership. This classification is based on the methods used by the leaders. Edwin Flippo has defined leadership style as "a pattern of behavior designed to integrate organizational and personal interest in pursuit of some objectives." Basically, the styles of leadership can be divided into two broad groups. These are: (a) Task-oriented styles, and (b) People-oriented styles. In the task oriented styles of leadership, more importance is given to getting the work done by subordinates. Task-oriented leaders are interested in the completion of work and do not give importance/attention to subordinates or their desires, interests and so on. Dictatorial leader and autocratic leader are the examples of this category. People-oriented style of leadership is basically democratic. Here, the leader gives importance to the interests, thoughts, problems, etc. of subordinates. He tries to achieve objectives with their support and co-operation. Participative or democratic leader comes under this category. Contingency / Situational Approach Theory. 7. Trait Approach Theory (The Traits Approach). 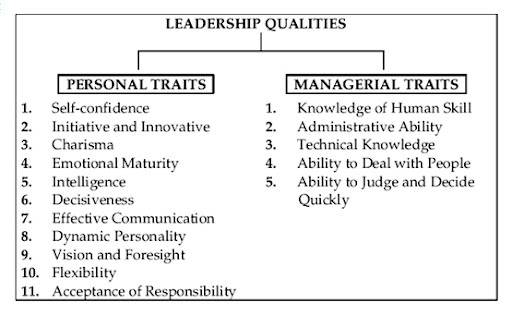 The traits approach theory was one of the first attempts to explain the leadership based on personal traits. Traits are inborn or acquired personal qualities of an individual. They include physical qualities and the qualities of head and heart. Traits theory refers to certain traits/characteristics which separate leaders from non-leaders. Such traits enable some to rise above their followers. The basic traits useful for leadership include height, energy, looks, knowledge and intelligence, imagination, self-confidence, integrity, fluency of speech, mental balance, enthusiasm, courage, sociability, and friendliness and so on. According to the traits theory, an individual possessing such traits is usually able to influence others and gets the status of a leader. This suggests that a leader is quite different from an average person in regard to personal qualities such as intelligence, perseverance and overall personality including physical features. The traits theory suggests that leaders are above the followers in regard to personal traits. A fair combination of such traits makes them influential and impressive as compared to others. Traits theory indirectly supports the view that leaders are born and not made. Researchers have suggested different traits of leaders. Such traits are similar to physical, psychological, mental, intellectual and other qualities which are normally treated as essential in the case of an ideal leader. It may be noted that some traits are innate while some others can be acquired through special efforts. The traits theory is based on the personal qualities (inborn/acquired) of an individual. Such qualities play a positive role in building leadership. A person becomes leader due to such traits. The theory is based entirely on personal traits and their contribution in developing leadership. 7.1 Limitations of Traits Approach Theory / Criticism of Traits Theory. Examples of leaders without certain traits are common : According to this theory, leadership is based on certain traits such as personality, intelligence, self-confidence, courage and so on. However, it is very difficult to find out a particular leadership trait in the greatest leaders of the world. Some known world leaders have had quite different traits. People with limited education, limited training and without well developed personality have proved to be great leaders. History is full of such examples of leaders. 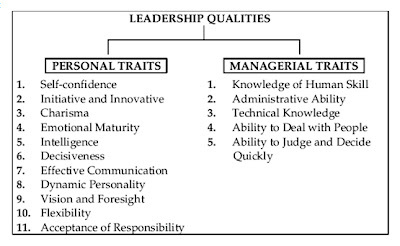 Traits are not absolutely essential for leadership : As per the theory, many traits are desirable in the case of leaders. However, none seems to be absolutely essential. Many leaders are extremely popular even without certain useful traits. Situational aspect is ignored : The theory fails to take into consideration the situation within which the leaders have to function. There are instances in which a leader is successful in one situation but may not be in another even when traits are same on both the occasions. For example, Winston Churchill was Prime Minister of England and was also war hero during the Second World War but was defeated in the general elections under new situation i.e., after the end of World War II. No reference to essential qualities : The theory fails to give the list of essential qualities (innate and acquired) required for leadership purpose. Superiority is not clearly stated : The theory states that a leader has superior personal traits as compared to his followers. However, the nature or extent of superiority is not given in a clear manner. The behavioral approach theory is an extension of the traits theory and is superior in certain respects. The traits theory failed to explain what caused effective leadership. The behavioral approach is based on the study of behavior of a leader. Leadership grows/develops not by traits but by the acts or experience of a person. The behavioral theory is based on the assumption that leaders are not born but they develop gradually by experience and maturity. The attention is given to what leaders do (i.e., their behavior) rather than to what they are. A leader learns new traits through his experience (behavior or acts). The focus point, here, is on what the leader does while leading. This behavioral theory suggests that a leader do not behave in the same manner under all situations. Similarly, his actions are not identical under all situations which he faces. He adjusts his behavior as per the need of the situation. There is an element of flexibility in his approach and behavior. He studies the situation and adjust his leadership style accordingly. He adopts different leadership styles to meet the need of different situations. Dr. Rensis Likert's Four Management Systems. The behavioral approach theory is practical in nature. It gives more attention to acts and behavior of a person and not to the personal traits. Leadership develops by experience and not by inborn traits. A leader has to acquire certain qualities by experience only. Like the traits theory, the behavioral approach oversimplifies the complexities of the leadership process. However, the behavioral approach is responsible for the development of a classification of leadership styles which has provided managers suitable opportunities to secure greater insight into their own behavior. 9. Contingency / Situational Approach Theory or Blanchard's Situational Leadership Theory. Situational/Contingency Theory is a new addition to the existing theories of leadership. It is a combination of different leadership styles such as autocratic, democratic and so on. An ideal leader studies the overall prevailing situation, draws conclusions about the whole situation and adopts the leadership style which is most appropriate to the prevailing situation. He is not concerned with one specific leadership style but will use any style as per the available situation. He is interested in achieving his objectives and is willing to use suitable means for this purpose. Sometimes he may be democratic but may be autocratic on some other occasions. "Different strokes for different folks" is his leadership approach. He will consider the group of employees (skilled, unskilled, supervisory, etc.) to be handled and adjust his leadership style accordingly. He will not use one leadership style for controlling/motivating all categories of employees. On the other hand, he will be democratic with some categories of employees and autocratic with the employees working at the other level. In other words, adjusting the leadership style as per the need of the situation or as per the group of employees/subordinates to be handled is the essence of situational leadership style. In brief, he studies the situation and adjust his leadership style accordingly. He adopts a practical approach in order to get his work done i.e. achievement of organizational objectives. In brief, in the situational leadership style, the leader adopts practical and flexible approach in decision-making. This is the essence of situational/contingency theory or approach. Contingency approach concludes that there is no "one best style" of leadership under all conditions. Efficient leadership style varies with situations and an efficient leader is one who studies the prevailing situation and finds out the leadership style which would be most suitable for the given situation. This is natural as a simple cookbook approach for selecting the best leadership style does not exist. A good leader has to study the situation and adjust his leadership style accordingly. Here, the focus is on the situation and not on the personal qualities and behavior of a leader. Situational leadership style is flexible/adjustable and is normally more effective as compared to other types of leadership. The situational theory of leadership was developed by Hersey and Blanchrd at the Centre for Leadership Studies in Ohio State University. 9.1 Important Features of Situational Leadership. Situational leadership is new addition to the existing styles of leadership. An ideal leader (according to this theory) studies the overall situation, draws conclusions and adopts the leadership style which is most appropriate to the prevailing situation. This is the essence of situational leadership theory. The best leadership style according to this theory is situational. An ideal leader is one who can adjust his style of functioning as per the situation within which he has to operate. This means the internal and external environment to the enterprise. A leader may act as a dictator at one time and also as a democratic leader on some other occasion. A good leader is one who studies the situation around him and adopts the most suitable leadership style. A situational leadership is a combination of all types of leadership. A situational leader knows different leadership styles but selects one particular style, which is most, appropriate to a given situation/environment. A situational leader adopts flexible approach in his style of functioning. This makes his leadership effective and result-oriented. A situational leader knows when to use autocratic style and when to use democratic style. He makes corresponding adjustment in his style. This makes him effective/successful as a leader. The situational theory suggests that a manager's leadership style should vary with the situation. This leadership model is simple and appealing. However, it ignores several other critical elements that determine leadership style and it does not have a wide accepted research base. Inspite of the limitations, this leadership model achieved considerable popularity and also awakened many managers to the idea of contingency approaches to leadership style. 9.2 Merits of Situational Leadership. The situational leadership theory is a practical one and is based on real facts of life. The best leadership style is situational. The situational theory has universal acceptance. It focuses attention not on the personality of the leader, but on the personality of the Organisation as a whole. The situational leadership theory is flexible and adaptable. It can operate in any style (autocratic, democratic, etc.) as per the need of the situation. 9.3 Limitations of Situational Leadership. In situational leadership, more importance is given to the situation and less to personal traits. Leadership should involve both traits and situations. However, the theory gives importance to situation only. The theory offers an incomplete explanation of the leadership process. 10. Question Bank On Leadership. What is leadership? Explain its functions. Explain the importance of or role of leadership in business. State and explain the qualities of a good leader. "Best type of leadership is situational" Explain.